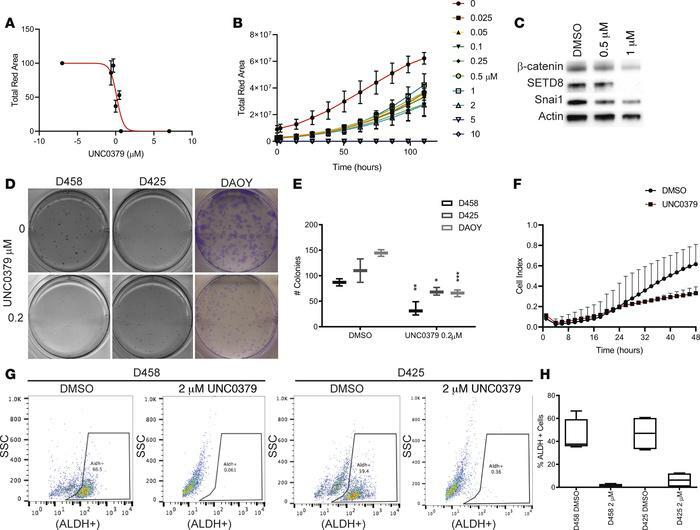 UNC0379 treatment mimics SETD8 knockdown in medulloblastoma cell lines. (A) Cell viability (total red fluorescence) of NucRed-expressing DAOY cells vs. UNC0379 (μM). Three independent replicates are shown as mean ± SD. IC50 of 2 μM was calculated with GraphPad prism. (B) NucRed-expressing D458 neurospheres treated with increasing concentration of UNC0379. Three independent replicates are represented in the line graph of cell viability (total red fluorescence) mean ± SD vs. time. (C) Western blot for β-catenin, SETD8, Snai1, and Actin from D458 cells treated with 0.5 μM or 1 μM UNC0379 for 48 hours. See also Supplemental Figure 6 for quantification. (D) Methylcellulose assay with D458, D425, and clonogenic assay with DAOY cells treated with 0.2 μM UNC0379. Representative images are shown. See also Supplemental Figure 6. (E) Box and whisker plots from D represent the mean ± SD from 3 independent replicates. Two-way Anova; *P < 0.05, **P < 0.01, ***P < 0.001. (F) Invasion assay of DAOY cells treated with 2 μM UNC0379 over 48 hours. Line graphs represent the cell index mean vs. time ± SD in 3 independent replicates. (G) Representative plots of Aldefluor+ cells vs. side scatter are shown for D458 or D425 cells with or without 2 μM UNC0379 treatment. (H) Box and whisker plot represents 3 independent replicates of percent ALDH+ cells with and without treatment. See also Supplemental Figure 6.